Several years ago we published the first article in a series under the general name “How Massage Heals The Body.” In these articles we reviewed modern scientific sources on what exact mechanisms Massage Therapy employs to deliver such powerful clinical results. This article reviewed fascinating data on how mechanical pressure elicited on the soft tissues alters function of the tissues all the way to cellular metabolism and even gene expression. This article was based on our much earlier publication – textbook Therapeutic Massage. A Scientific Approach (2002). At the time of the textbook publication, it was criticized by some authors and therapists as overreach since data presented there discussed how pure mechanical pressure elicited vertically on the soft tissues in an experimental setting triggered a variety of cellular events. Yes, it was true that mechanical pressure wasn’t delivered in the form of massage therapy strokes, as we understand it, but rather by scientists applied direct tissues’ steady compression by a mechanical device. Of course, MT is a way of deliverance of cyclic mechanical pressure to the soft tissues and for me as an author and clinician it was the same thing as a steady pressure application and it perfectly explained what we regularly observe in our clinic. However, yes, from a pure scientific point of view the data discussed in the textbook and later in the article didn’t reflect the notion of how massage strokes, not steady pressure, impact the cells which form soft tissue. Despite that I think that we had all rights to disagree with the critique, it was still lingering on the background. To our professional excitement, 2018 brought clear justification that we were right all along and data that we shared with our students and readers since 2002 was completely correct all these years. Such powerful support came from very elegant study published in the Journal of Physiology (Miller et al., 2018). Thus, this article is review of results of that exceptional study which shines scientific light on rarely mentioned data in any Massage Therapy source or publication. A combined team of scientists from Colorado State University and the University of Kentucky decided to examine if mechanical pressure in the form of MT strokes delivered as cyclic compressive loading indeed triggers the same cellular events in the tissues which were earlier detected when pure vertical mechanical pressure was applied to the soft tissues. Group 1 consisted of rats with normal weight bearing limbs (WB Group). Group 2 consisted of rats with right hindlimb suspended for 14 days to trigger muscle atrophy (HS Group). Group 3 consisted of rats after 14 days of suspension + animals were allowed full weight bearing for 7 days (RE Group). Group 4 consisted of rats with right hindlimb suspended for 14 days to trigger muscle atrophy. After 14 days of suspension the animals were allowed full weight bearing for 7 days WITH massage strokes imposed every other day for 30 minutes with total of four bouts (REM Group). It’s very important to mention that all MT strokes were applied on the fully anesthetized animals to completely exclude the brain’s motor response to the massaged muscles. To have some consistency of the obtained data a special cylindric mechanism was designed to emulate, as close as possible, MT strokes while giving the scientists the chance to use exactly the same force during MT strokes application on all animals. After sacrificing the animals, the scientists examined the size of muscle cross section, activity of protein contributed to the muscle growth, as well as impact of MT strokes on DNA synthesis. The results obtained by the authors are astonishing for the entire MT profession and they put solid scientific foundation for practicing clinical aspects of MT. Let’s discuss them in detail. REM group: adding massage every other day to the weight bearing muscle significantly increased average cross section area of the gastrocnemius. Fig. 1 illustrates immunostained (in green) cross section of the gastrocnemius muscle in each group. Fig. 1. Immunostained cross section of gastrocnemius muscles in each group (Miller et al., 2018). REM – cross section of myofibrils after 14 days of suspension + 7 days of weight bearing + massage strokes. Notice significant increase of myofibrils’ cross section compared to the animals in the HS group with experimentally induced muscle atrophy. At the same time the authors registered the elevation of protein degradation rate in the skeletal muscles of the animals in the REM group. These changes were similar to exact changes that occurred in muscles with resistance exercise. CONCLUSION: Mechanical cyclic compression of the skeletal muscles in the form of massage strokes activates mechanotransduction machinery (discussed below) when pure mechanical stimuli applied externally trigger greater protein synthesis inside the cells. In other words, massage strokes triggered new muscle tissue production in atrophic muscles in greater rate than exercise. Besides registering this exciting fact the authors were able to reconstruct the mechanism of the rebuilding effect of massage strokes on muscle tissue. In the membrane of myofibrils the most abundant family of integrin receptors is called Itg7a. The authors detected significant increase (see Fig. 3) in concentration of Itg7a integrins in the gastrocnemius muscle of animals in REM group (suspension+weight bearing+massage). Fig. 3. Concentration of Itg7a in each group of animals (Miller et al., 2018). HS Group – hindlimb suspension for 14 days. RE Group – 14 days of suspension + 7 days of weight bearing. REM Group – 14 days of suspension + 7 days of weight bearing + massage strokes. 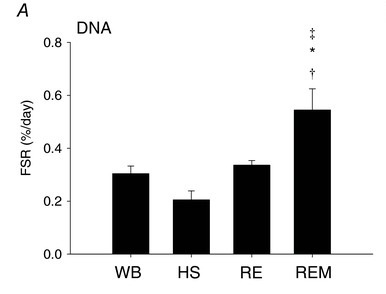 Please notice that number of integrin receptors in REM group (animals treated with MT strokes) was even slightly higher than in WB group (normal animals). CONCLUSION: The increase in concentration of Itg7a in the massaged group is a direct indicator of activation of intracellular synthesis which is registered as an increase in cross section of myofibrils in the REM group (observed in Fig. 1). 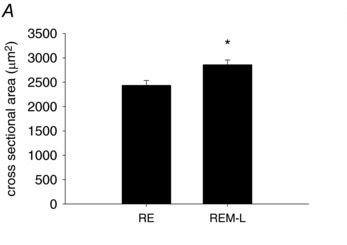 Finally, the fact that in the REM group elevation of protein degradation rate was registered indicates that MT is directly responsible for the process of remodeling in the muscle tissue “…in response to external mechanical stimulus” (Miller et al., 2018). Macrophages – the main troops of our immune system who are responsible for fighting infections, removing debris and at the same time these cells repair and remodel the damaged or inflamed muscle cells. Fibroblasts – are constantly synthesizing extracellular matrix and collagen for connective tissue structures while being a major repair force responsible for collagen deposit in the site of injury and scar tissue formation. These cells will appear and concentrate in the examined area only if needed and if their number increases it means that their DNA must be activated by the therapy which a scientist would like to examine. That is exactly what authors of this study did since they examined DNA synthesis in muscles of the animals from each group using a number of satellite cells and their active engagement as an indicator of DNA’s activity. The special testing revealed a very surprising fact. In the REM group the number of these cells was way larger even compared to the normal weight bearing (WB) Group!!!! Fig. 4 illustrates results of DNA synthesis in each group. Fig. 4. Increase in DNA synthesis in massaged group of animals (Miller et al., 2018). Please compare results from the WB (0.3 %/day) and REM (0.55 %/day) groups. This data proved that massage strokes via mechanism of mechanotransduction reached the cell nucleus where DNA is stored and activated it. Such activation was registered by the authors of the study as an increase in the number of satellite cells. CONCLUSION: Massage strokes stimulate DNA synthesis in the massaged tissues which is registered as new cells appearance which is responsible for the tissue defense, remodeling and improved circulation. Authors stated that data we are going to discuss now was “perhaps the most surprising result from this study” and it is truly is. The authors decided to examine if there were any changes in the muscles on contra-lateral non-massaged extremity. To do that they conducted exactly the same testing on the left gastrocnemius which was not even massaged. 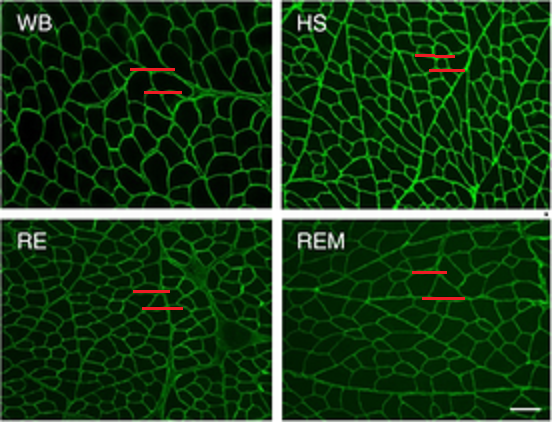 To their complete surprise a cross section of myofibrils on the left non-massaged side in REM group (suspension+weight bearing+massage) was larger than the cross section of myofibrils on the right gastrocnemius of the animals in the RE group (suspension+weight bearing but no massage strokes). Fig. 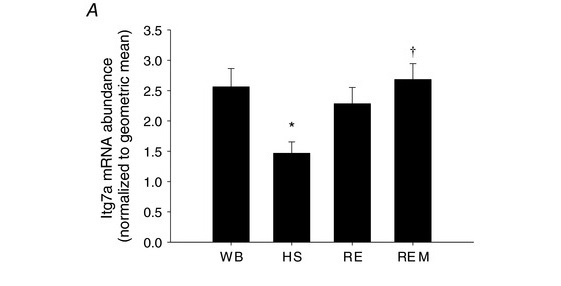 5 illustrates the size of the cross-section area in non-massage, left gastrocnemius in the REM group compared to the animals in the weight bearing RE group on the right side. Fig. 5. Cross section area in non-massaged, left gastrocnemius in REM group compared to the animals in weight bearing RE group on the right side (Miller et al., 2018). 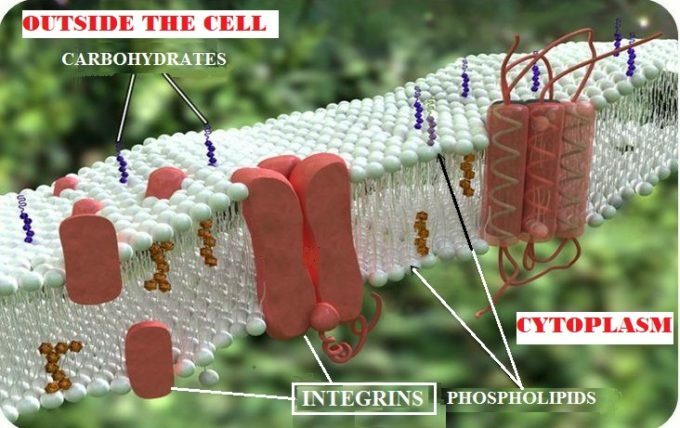 Despite that the cross section of the myofibrils on the non-massaged side was larger, the scientists didn’t register any increase in DNA synthesis and increase in the number of satellite cells registered on the massaged side. It means that the increase in the size of myofibrils on non-massage side was purely mediated by nervous system! CONCLUSION: As a student in Medical School I was taught to always prescribe Medical Massage Therapy on the patients’ healthy side if they were immobilized after the surgery on the traumatized side. While being a student I didn’t take it seriously. However, when I started to practice medicine, I witnessed firsthand the important contribution to the patient’s recovery, after the cast was removed, if Medical Massage was performed on the healthy, unaffected side during the entire time of immobilization. The results of this study finally put scientific backing to the years of clinical observation. Why did the cross-section of muscles on the non-massaged side increase? The authors correctly identified that as a cross-over effect which “…is neurally mediated” and in these cases “…massage acts through the activation of the sympathetic nervous system to cause the anabolic cross-over effect and this could be achieved through direct neural mechanisms as well as endocrine-like processes” (Miller et al., 2018). 1. This study used very sophisticated, modern scientific and statistical techniques to analyze obtained data and the authors for the first time directly linked application of massage strokes to profound changes on the cellular level while animals were completely sedated, i.e., without any brain participation. 2. The study confirmed that massage strokes applied in a cyclic compression regime are able to alter and activate the most important and basic element of life – our cells’ DNA. From our perspective nothing else can beat such fundamental discovery! 3. This data gives therapists a deeper understanding of what impact they elicit when pressure, as a precious therapeutic tool, is applied in the correct regime. There is no place for the ‘no pain, no gain’ approach in the clinical application of MT!!! 4. If cyclic compressions are such an effective clinical tool which improves muscle functions, even on the opposite, non-massaged side, then the training and ability of the therapist to mastermind all 12 types of kneading is the ‘bread and butter’ of the profession. Nothing else, in manual medicine, can deliver the powerful therapeutic effect of cyclic compressions on superficial and deep skeletal muscles as clinical application of various kneading techniques developed by the Western School of MT in the last 100 years. 5. The results of the study published in a very respected scientific journal should be shared with physicians to better explain the justification for the MT prescription to patients with various somatic dysfunctions.